The intersection numbers of the moduli space of p spin curves have been studied through the random matrix theory with an external source. The topological invariants of Gromow-Witten are explicitly obtained for P1 case. When the Riemann surface has a boundary, i.e. hole, the intersection numbers are obtained from Kontsevich-Penner matrix model. We generalized this open intersection numbers for p-spin curves. We published a book for these studies (Brezin and Hikami, SpringerBrief, Mathematical Physics, Vol. 19 (2016)). This random matrix theory with an external source is also related to Klein surface. We had a workshop MCM2016 for higher Teichmuller space, in which we discussed super Riemann surface, and moduli space of matroid. Identifying precursors to large earthquakes has been a difficult, but important challenge both in science and in our society. As the available data have increased drastically in the past decades, there have been steady accumulations of tantalizing evidences that this should be possible as communicated to us through the enlightening discussions with Tetsuo Yamaguchi (Kyushu University) and Takahiro Hatano (Earthquake Research Institute). We studied two directions both using the big data: the one is based on detecting the critical increase of the sensitivity to the tidal-triggering (p-value), and the other is based on machine-learning the inter-time distribution of the low frequency earthquakes (LFEs). The p-value is calculated to introduce a hypothetical 2-dimensional incompressible fluid, in which the power-law of the fully-developed turbulence is observed in a narrow range of the velocity power spectrum; the precursor is found several months before a few large earthquakes as a tiny vortex which may grow via the inverse energy cascade. On the other hand, we focus on the inter-time distribution of the LFEs among the various manifestations of the slow earthquakes, which have recently garnered much attention in the hope of understanding the mechanisms of earthquakes; four homogeneous classes of the LFEs in northern Japan are identified via the cluster analyses in machine-learning the JMA catalogue. Remarkably, the shortest inter-time class (median 23 seconds) is found to show both a significantly-lower seismicity about four months before and a complete quiescence (p-value = 0.0002) of 30 days before the 2011 Great Tohoku Earthquake. A cell can be considered as a complex universe of various interacting molecules including proteins, RNA and many other transcripts. There are more than 10k proteins in each human cell at the same time. Every cell contains the DNA in their nuclei coding more than 30k genes. Recently, this huge transcript networks can be observed experimentally using the high-throughput equipment such as microarrays or the second-generation sequencing. The transcript networks manifest the cellular behavior, so the difference between the normal cells and disease cells such as cancers has been investigated deeply. There are also huge computational studies which infer interactions between the members of the transcript networks. We study gene interaction networks in various human cancer cells with the random matrix theory. We apply the random matrix theory to the computationally inferred gene interaction networks and found the universal behaviors. We observed the Wigner’s surmise is valid in the eigenvalue density function of interaction matrices of dense gene interaction networks. The distribution of nearest neighbor level spacing becomes the Wigner distribution when the network size is large, and it behaves as the Poisson distribution when the network size is small. We expect that the random matrix theory provides an effective analytical method for investigating the huge interaction networks of the various transcripts in cancer cells. Quadratic differentials, meromorphic tensor fields on Riemann surfaces of some special type, have been studied classically in hyperbolic geometry and complex analysis. Recently it has been clarified that low-dimensional topology including hyperbolic geometry of surfaces is closely related to mathematical physics and integrable systems. This can be illustrated by the topological recursion by Eynard and Orantin generalizing computation of the Weil-Petersson volume of the moduli space of Riemann surfaces, whose influence one can find in various research areas. Accordingly quadratic differentials are playing some important roles also in mathematical physics and integrable systems. In this workshop, we will read intensively some research papers on the geometry of quadratic differentials and related topics, and will have some talks on original researches. 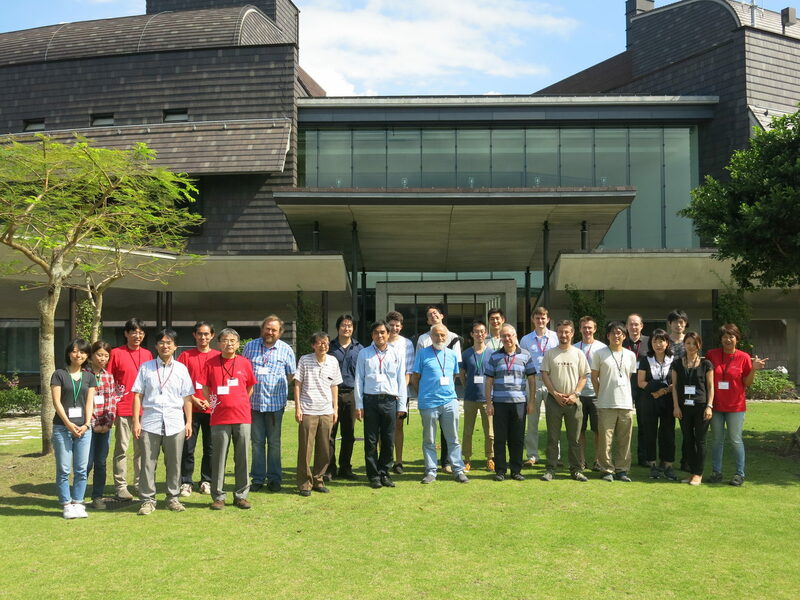 This workshop is supported by a joint project between the OIST and the University of Tokyo. Abstract: ADS/CFT correspondance has led to a number of conjectures concerning, conformal invariant, U(N) symmetric 3D field theories with Chern-Simons term for N large. An example is boson-fermion duality. This has prompted a number of calculations to shed extra light on the ADS/CFT correspondance. We study here the example of gauge invariant fermion matter coupled to a Chern-Simons term. In contrast with previous calculations, which employ the light-cone gauge, we use the more conventional temporal gauge. We calculate several gauge invariant correlation functions. We consider general massive matter and determine the conditions for conformal invariance. We compare massless results with previous calculations, providing a check of gauge independence. We examine also the possibility of spontaneous breaking of scale invariance and show that this requires the addition of an auxiliary scalar field. Our method is based on field integral and steepest descent. The saddle point equations involve non-local fields and take the form of a set of integral equations that we solve exactly.